Today, just a few days before the Salon International de la Haute Horlogerie (SIHH) opens its doors in Geneva, the Richemont Group and Baume & Mercier unveil what is the result of more than four years of research and development by the Richemont Group’s Research and Innovation Team: The Baumatic™ caliber. One of the factors making this high-technology announcement so unusual is that the Richemont Group has given its use – first and foremost – to Baume & Mercier. It is a highly unusual move to showcase new technological innovations in a brand that is typically more mainstream than high-tech haute horology. Indeed, the Richemont Group – which owns Cartier, Panerai, Jaeger-LeCoultre, A. Lange & Sohne, IWC, Montblanc, Piaget, Vacheron Constantin, Van Cleef & Arpels, among other brands — could have selected any brand for the launch of its newest inventions. By selecting the relatively affordable Baume & Mercier brand for the unveiling, however, the Richemont Group R&D team may have hit the nail on the head. After all, what better way to get the word out that the company has basically reinvented the proverbial wheel than by using an accessible brand. 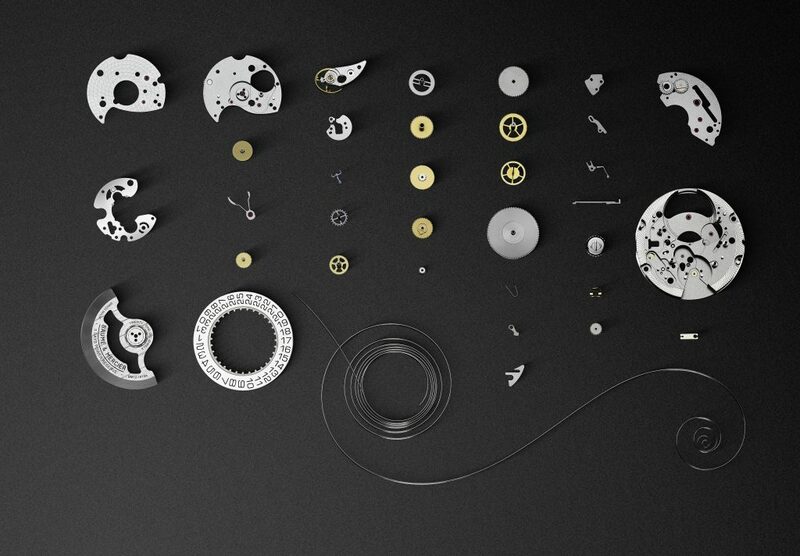 The quest for new technology was begun by the Research and Innovation Team as they endeavored to create the Richemont Group’s first silicon balance spring and silicon escapement. Along with those efforts, the Team also further developed new alloys and methods of binding silicon to offer a watch that is highly improved in autonomy (power reserve), accuracy, durability and resistance to shock and magnetism. It then gave the proprietary technology, trademarked and patented, to Baume & Mercier for use in its Clifton Baumatic watch. The Baumatic™ BM12-1975A Caliber (the 1975 makes reference to the year that the brand first released a “Baumatic” watch) consists of four key technologies that propel the movement to the forefront of accuracy and precision. 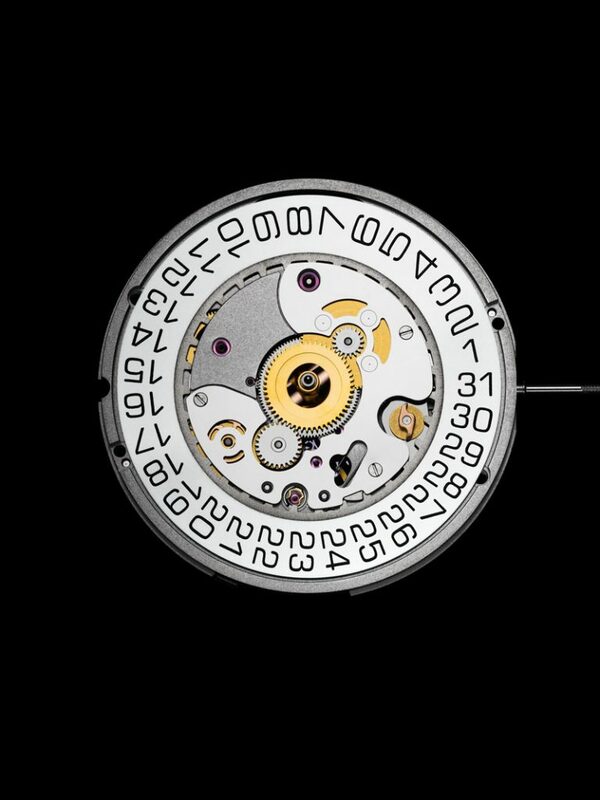 1 – The BM12-1975A Baumatic™ Caliber is equipped with the Richemont Group’s first silicon hairspring with Twinspir™ technology. The Twinspir technology was first unveiled in the Baume & Mercier Clifton 1830 manual wind watch with Caliber MB12-1975M — last year. It is a silicon balance spring with one bridge for the mainspring barrel and winding wheels and another bridge for the going train. The balance spring was made of two layers of silicon – hence the name Twinspir – with a third layer of silicon dioxide between them. The silicon reduces the variation in elasticity that occurs in regular balance springs – making this balance spring much more constant when it comes to restoring force. The center layer of silicon dioxide offers temperature compensation. Additionally, it is a free-spring balance (no regulator) so the rate is controlled via adjusting four masses on the balance rim. That first watch, though, came in at a price just under $15,000. 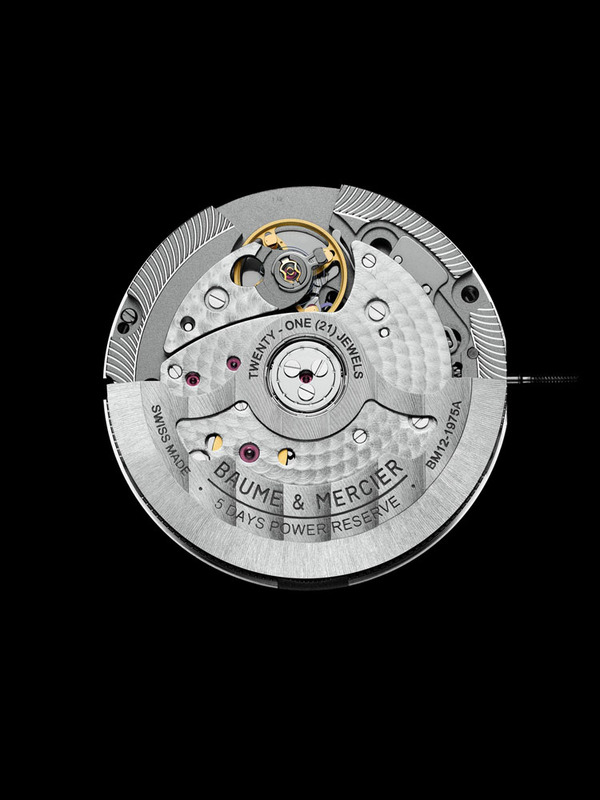 The Baume & Mercier Clifton Baumatic watch movement is also fitted with the brand’s first silicon escapement. Use of silicon for the hairspring and escapement makes the watch much more durable, reduces service needs and makes it more anti-magnetic. In fact, this watch is resistant to magnetic fields up to 1,500 Gauss, 25 times more resistant than a “normal” watch without silicon escapement or soft inner iron case. Baume & Mercier Clifton Baumatic(TM) caliber represents all-new technology from the Richemont Group’s Research & Innovation Team. The caliber is lubricated with top-quality, enhanced lubricants that will reduce friction last longer and reduce the need for frequent servicing. The Richemont Group’s Research and Innovation Team have tested the oils under extreme stress conditions over a period of time and studied them for wear conditions emulating more than 10 years of use in today’s active lifestyles. Stronger anti-magnetism to combat everyday magnetic contact with magnetized handbags, cellphones, and cell phone covers that double as chargers, microwaves and more. Accuracy to -4/+6 seconds per day throughout the entire 120 hours of power reserve. Attesting to the competency of this new caliber, the Baume & Mercier Clifton Baumatic™ watch is also a COSC-certified chronometer. As to the design of the Baume & Mercier Clifton Baumatic™ watch, the classic look is a great contrast to the high technology within it. The watch measures 40mm in diameter, is crafted in stainless steel with curved horns and a scratch-resistant anti-reflective domed sapphire crystal. The flat white dial is sandblasted and lacquered, to give it a porcelain-like finish, and the self-winding movement offers date, five days of power reserve (as mentioned) and is water resistant to 50 meters. It comes with a two-year warranty. Best of all, though, may be the price. 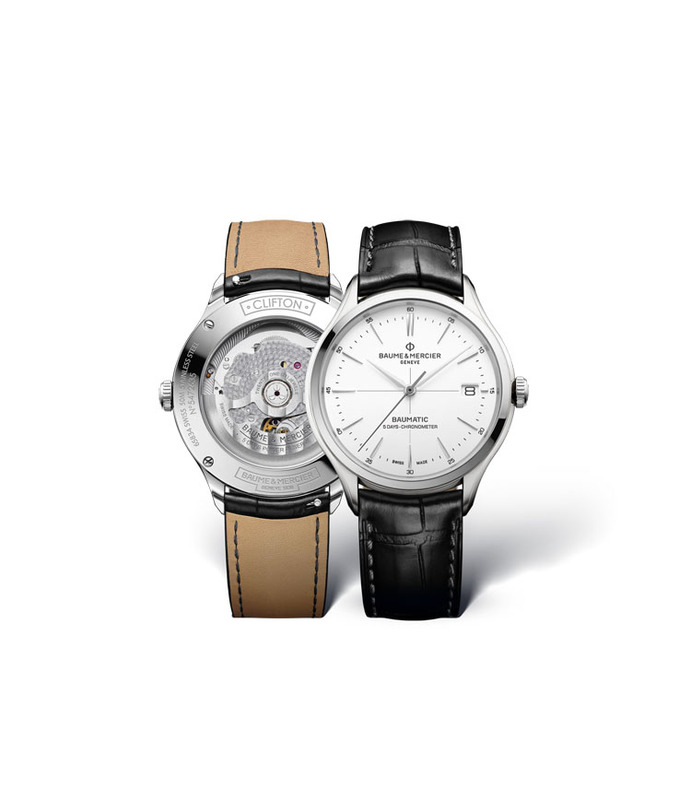 The Baume & Mercier Clifton Baumatic™ watch, which packs a powerful punch for consumers, retails for $2,790. Why would anyone not buy this timepiece? 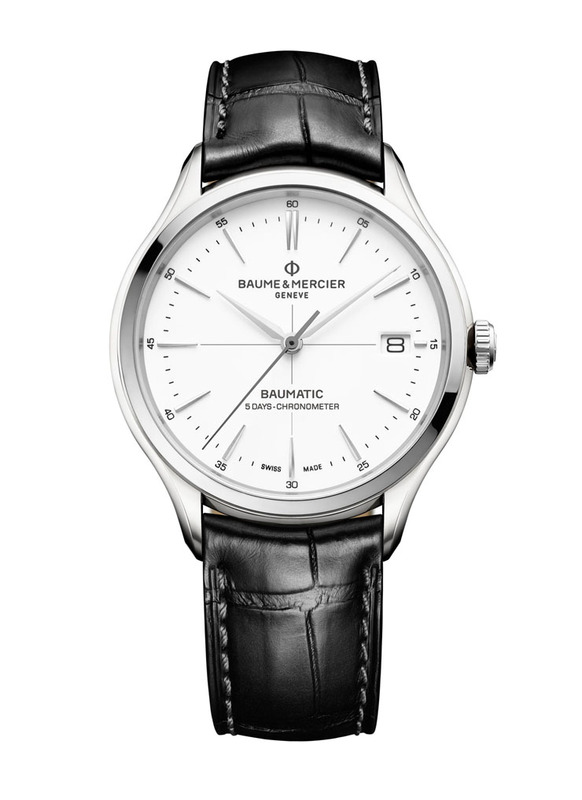 Baume & Mercier Clifton Baumatic(TM) is crafted in stainless steel with lacquered dial. Case: 40mm diameter x 10.3 mm thick, polished and satin-finished stainless steel, scratch resistant antireflective domed sapphire crystal, sapphire caseback fixed with 4 screws. Dial: flat white, sanded, lacquered for porcelain-type finish, faceted and riveted indexes, enlarged date window, lancet hands. Strap: interchangeable black alligator strap with slate-gray stitching, curved bars, pin buckle.